Sea-level rise over the next century is expected to contribute significantly to physical changes along open-ocean shorelines. Predicting the form and magnitude of coastal changes is important for understanding the impacts to humans and the environment. Presently, the ability to predict coastal changes is limited by the scientific understanding of the many variables and processes involved in coastal change, and the lack of consensus regarding the validity of existing conceptual, analytical, or numerical models. In order to assess potential future coastal changes in the mid-Atlantic U.S. for the U.S. Climate Change Science Program (CCSP), a workshop was convened by the U.S. Geological Survey. Assessments of future coastal change were made by a committee of coastal scientists with extensive professional experience in the mid-Atlantic region. Thirteen scientists convened for a two-day meeting to exchange information and develop a consensus opinion on potential future coastal changes for the mid-Atlantic coast in response to sea-level rise. Using criteria defined in past work, the mid-Atlantic coast was divided into four geomorphic compartments: spits, headlands, wave-dominated barriers, and mixed-energy barriers. A range of potential coastal responses was identified for each compartment based on four sea-level rise scenarios. The four scenarios were based on the assumptions that: a) the long-term sea-level rise rate observed over the 20th century would persist over the 21st century, b) the 20th century rate would increase by 2 mm/yr, c) the 20th century rate would increase by 7 mm/yr, or d) sea-level would rise by 2 m over the next few hundred years. Potential responses to these sea-level rise scenarios depend on the landforms that occur within a region and include increased likelihood for erosion and shoreline retreat for all coastal types, increased likelihood for erosion, overwash and inlet breaching for barrier islands, as well as the possibility of a threshold state (e.g., dramatic change in barrier evolution, such as segmentation or disintegration) for some barrier island systems. The likelihood of the potential coastal responses is expressed using standard terminology employed in climate change assessments (e.g., as used by the Intergovernmental Panel on Climate Change and CCSP). This assessment was based on the coastal geomorphology in its present condition and does not consider any coastal protection that might be undertaken in the future. The committee recognized that a variety of erosion mitigation measures have been implemented along developed portions of the coast and these are very likely to be applied in the future. It was also acknowledged that economics, political will, and other factors can drive decisions to implement these measures, and that such decisions cannot be predicted with confidence. The results of this assessment are depicted graphically on maps of the study area. 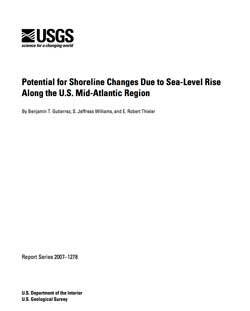 Citation: Gutierrez, B.T., Williams, S.J., and Thieler, E.R., 2007, Potential for shoreline changes due to sea-level rise along the U.S. Mid-Atlantic Region: U.S. Geological Survey Open-File Report 2007-1278.